I'm going to annoy you this week when I do that thing I begrudge The Guardian Weekend and The Sunday Times Style magazine doing - a men's special! I'm in love with men's boots or more specifically the super soft leather that looks like mesh due to the punched hole detail. i love the Oakwood boots. I don't know, I just really have this weakness when it comes to beautiful shoes. I like both pairs, sadly my OH didn't. Love those boots and always love the Guardian's menswear specials. I'd wear those top ones in a heartbeat. Vintage vixen - I so want a pair but they only go down to a six. I do like the menswear special really but I'm a greedy women's fashion devourer! That first pair is gorgeous. 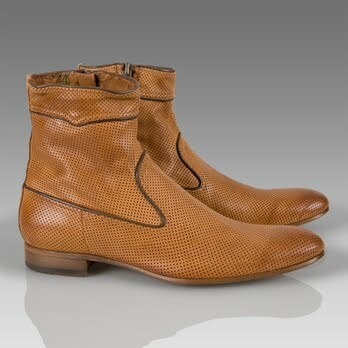 I LOVE Paul Smith men's shoes! They are great for big-footed women, and they're made so beautifully!